"Avatar", directed by James Cameron, is a 3D science fiction epic film set in the year 2154 which tells the story of an ex-Marine, Jake Sally - played by Sam Worthington - who is confined to a wheel-chair following a war on Earth. He is selected to take part in the Avatar Program - where his mind will control a healthy body on a remote world - and sent to Pandora, a rainforest-covered moon of the planet Polyphemus, some 4.3 light years from Earth. It is inhabited by strange criatures, the Na'vi, a humanoide race with their own language and culture. Humans are unable to breathe Pandora's air, so the Avatar Program creates bodies designed to look like Na'vi, grown in vats using a combination of human and Na'vi DNA. Humans then "drive" the Avatar bodies as they explore Pandora. Through his Avatar body Jake will be able to walk again. Na'vi people are ten-foot tall, blue skinned creatures with zebra stripes and a long tail pointed into a diamond at the end. The facial features are leonine, with enormous golden eyes and large, pointed ears. they are phisically stronger and taller than humans and they live in harmony with nature, worshipping a mother goddess called Eywa. At once, we can notice the bioluminescent terrifying beauty of Pandora, the plants are a spectacle of greens, blues, pinks, and purples without being the slightest bid gaudy. Some of the plants look like jungle flowers , others like hanging butterfly wings. Humans are engaged in mining Pandora's natural resources, a precious mineral, called unobtanium which can save Earth from its present energy crisis. Indigenius Na'vi must resist the colonists' expansion which threatens the continued existence of the Na'vi and the Pandoran ecosystem. While Jake begins to bond with the native tribe and quickly falls in love with beautiful alien Neytiri - Zoe Saldana - restless Colonel Quaritch moves forward with his ruthless extermination tactics forcing Jake to take a stand and fight back in an epic battle for the fate of Pandora. 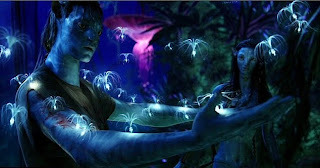 The film ends with the Na'vi performing the ritual that permanently transfers Jake from his human body into his Na'vi avatar. "Avatar" has been a film revolution offering as big a leap in our viewing experience as the change from black-and-white television to colour. James Cameron has pushed technical effects to the limit. It's not the first time cinema has flirted with 3D but the results have often been derided. Cameron waited 15 years before starting filming as technology had not advanced enough to portray his vision. So, he co-developed a new generation of stereoscopic cameras. Simplified, this is the equivalent of two cameras strapped together, each providing a slightly different perspective on the scene, mimicking the way human eyes view the world in three dimensions. Our impression with previous experiences of 3D was one of a flattish image with the occasional object "flying" at us, but now the entire screen has depth, taking on the appearance of a window through which the viewers are watching a "world" on the screen with a distinct foreground and background, rather than a flat, moving painting. The cinema screen becomes a theatre stage. Viewers will need to wear glasses to get the illusion. They are polarising glasses which do not cause the headaches experienced in the past since each lens has a different filter which removes different part of the image as it enters each eye. This gives the brain the illusion it is seeing the picture from two different angles, creating the 3D effect. And now you can enjoy the official trailer. • I'am going to watch that film, but not in the fourth row. Maybe this week I'll do it. Estoy faltando a mi promesa y me paso en media hora. Me arriesgo a una buena bronca para decirte tres cosas. 1.- Me encantó avatar, más de lo permitido por mi edad y condición... me encantó. 2.- Me tienes abandonada...ven a verme, te echo de menos.